I think “aware” is a good word for my past experience with freeboarding. I guess I’ve known about it, but never actually seen it first hand and also never really looked into it much. That is, until I was reading a post over on Afterbang that Gavin wrote about snowboarding alternatives. He pointed readers to a vimeo channel where I found this video. all the curves men like from CHoE on Vimeo. But, it looks awesome and a ton of fun. I can’t imagine the pain associated with taking a digger at high speeds though.. However, i suppose all extreme sports have their risks. The fact is, this is probably the closest you can get to snowboarding on the street. The carving maneuvers are capable because of the third set of wheels strategically placed under the board. Combined with a unique binding system among other features makes the freeboard the perfect alternative to snowboarding in this day and age. I’d love to give this a shot, but obviously money and a serious lack of good hills is holding me back. OK, it may be a little bit of nerves holding me back as well. While we do have hills here in New Hampshire, id probably get hit by a car on my first run! (kidding). But in all seriousness, have you or anyone you’ve known ever tried this? I’d love to hear some first hand accounts. Logan, check out Freebordsite.com (my website) — I try to push people towards Black Diamond Sports, as they have a great selection of freebords and custom kits. I haven’t purchased one yet simply because im more concerned with the upcoming boarding season. Equipment, passes, tickets, etc… needed to save some $$$. Still considering very much for next spring though. Thanks for all the input guys. these are my life!!!!! best summer and year round fun!!!! ever!!!! get one and ride!!! Like everyone said you definitely need to buy one of these bad boys. Best money I’ve ever spent x 3. All i gotta say, is that you have to definately get one of these. Just try to find someone who has one, so you can try it. This thing is really powerfull. Its meaning is not to forget snowboard and start freebording, but to snowboard when there’s no snow. All snowboarders live half of the year in a almost a depressive mood, i can tell you that since i got this babe, summer has become much easier to go through. cheers for using one of my pictures! stoked to see it on here. props on your article; articles written by guys who haven’t tried freebording yet are usually a bit negative-ish. i’ve been freebording for about 5 years now and let me tell you that you really need to give it atleast a try. it’s not at all like snowboarding when you first step on it, but give yourself a couple of minutes and you’ll be able to link your first turns and slides. and from that point it just gets better and better. I am 47 and my daughter is 17 and we took up Freebording after our our first season of Snowboarding ended last year. Don’t worry so much about falling, it is not that bad. Just take it easy at first and wear protective equipment. Nice, im 27 and even feeling a bit old (not to make ya feel bad haha) but your comment actually encourages me even more. I think it’s pretty much set in stone now, just need to pull together some cash for the equipment. 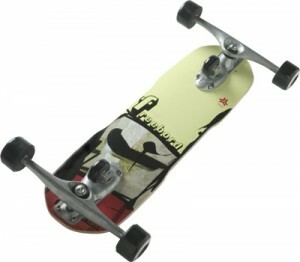 Thanks, freebord.com was the first place I landed when I started looking into them. I’ll have to poke around the forum a bit for sure. I started snowboarding at the beginning of this year, and fell in love with it. After the season ended my friend told me about freebording and we both ordered bords that arrived just as the last bits of snow were melting in March. Took a bit to get over the fear of eating asphalt, but once we got the hang of it we were hooked. Have gotten to meet a lot of the pros and other riders and the community is fantastic, everyone is super laid back and helpful in teaching how to improve your riding. I never really knew such a close alternative existed, I’m still watching the videos in complete awe haha. Can’t wait for winter either, every year around September it’s all I can think about until it actually snows. Freebording is the ONLY and I mean ONLY concrete ride that mimics the feel of a snowboard. A lot of people out there may be saying “no way, it looks like a ripstick with extra wheels”, or that they can do everything you can do on a freebord on a longboard. Straight up it gets close but its never as smooth or the same feel. THE LEARNING CURVE AT RIDING A FREEBORD IS VERY VERY STEEP! You man spend 2hrs, 2 weeks, or 2 months trying to learn the basics. Steeper hills are easier to learn on, but freak more people out. DONT GIVE UP, get one and never regret it. I live in Nashville TN, where we get 0 snow a year, and this gives me all the snowboard action I could ever need. hello bro. I just want to say i also board in Nashville. There are some pretty sick hills here and iv found a few other longboarders, but no one else that freebords. I got my board three weeks ago, and after a few days of practice, it finally clicked and its the best feeling ride ive had since snowboarding. I’m getting my friends into it, but they have only tried it a few times and so none of them really know what it feels like to even link turns and slide. good to hear there are fellow boarders here in nashville. dude im not sure where to tell you. i mean there are some really big hills headed out towards franklin but i know some guys who ride alot in percy warner park alot. im not sure if its actually legal to ride in the parks but im working on finding out. regardless there are some huge hills in the parks there. too many people though. i bet a night run with a headlight would be a blast cause there wouldnt be a single person to worry about. keep it chill and good luck. Man. You have to get one of these. Having hills kind of a big deal, espeically when you get better. It has a steep learning curve but the reward of being able to shred the pavement is an indescribable feeling. You can learn to ride it on flat (not as easy as a longboard) or you can take it down the steepest mountain road. After it ‘clicks’ in your head, you hardly take a fall. Check out some used spots like your local ads or eBay. Hit up the freebord forum to see if people are around that you can demo the board. Although, I must say, it may (most likely) won’t ‘click’ for you in an hour or less of riding. Hello all. I have been riding a freebord for around 6 months. It truly is just like snowboarding the streets. All turning and edging is exactly the same as on snow. When you scrub speed it even sounds like snow. I live in Manchester, New Hampshire. Riding late night helps keep traffic at bay. I have the smallest deck, as I’m ridiculously short. It’s good up to 5’6 riders. email me at skatehigher1@live.com. Come ride with me. Hey man, im only 5’5 so thanks for the heads up on the board size. That’s a 75mm right? Also i live 15 minutes from Manchester, if I start riding Ill shoot you an email for sure. Might not be until spring, but I’ll see what i can do.